Wine Ch. 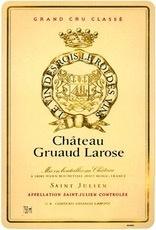 Gruaud Larose 2011 - Royal Wine Merchants - Happy to Offer! Brilliant purple black robe. The com- plex nose at first suggests notes of light tobacco and cigar box, and then opens up to notes of roasted coffee, red fruits, spices, and prunes. Ample and fleshy in the mouth, with plenty of body and density.